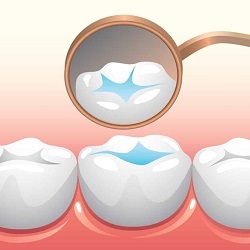 Dental Ssealants are plastic coatings that are typically placed on the chewing surfaces of the molars and premolars to protect them from decay. These teeth tend to have deep grooves or pits and fissures that can be challenging to clean effectively with a toothbrush's bristles, and so they're more susceptible to cavity formation. Dental sealants are most commonly placed on child patients, although adults can also benefit from the treatment. Sealants are ideal for younger patients because they help to keep children's teeth cavity-free from the very beginning. However, dental sealants will typically wear with time and will require that the dentist keeps an eye on them and restores the sealants whenever necessary. This process is just as simple as placing a sealant initially. Placing sealants is a speedy and painless process for the patient. First, the dentist cleans and dries the tooth/teeth being treated, and then applies an acidic gel to allow for a more durable bond. The gel is then removed and the sealant is placed on the grooves of the tooth. The sealant material is finally hardened with a special blue light. The material will not cause any interference with the patient's natural bite, and are not uncomfortable by any means. To learn more about how dental sealants can benefit you or your child, contact our Guelph Dental clinic today.